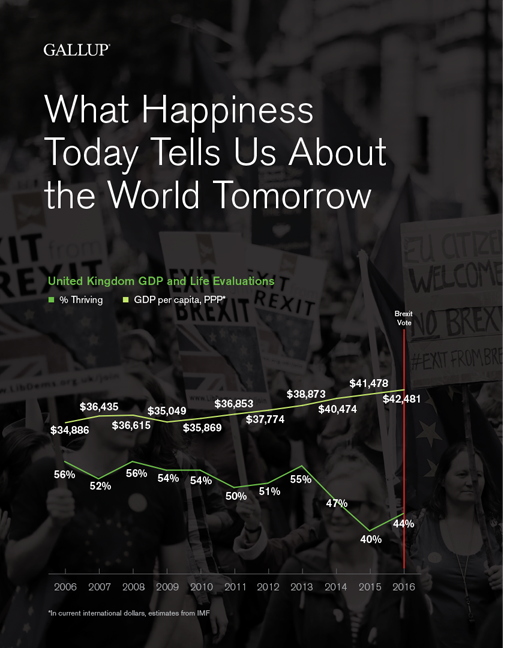 Read Gallup's report, What Happiness Today Tells Us About the World Tomorrow, to find out whether the world's citizens think they are better off today than they were 10, or even three, years ago -- and who is on track for change. Find out where your world is heading. how the world's citizens rate their lives from "worst possible life" to "best possible life"
Learn important insights on happiness from the Gallup report. Explore recent trends in the life ratings of the world's citizens. Please fill out the form below to receive an email with a link to a PDF of the report. Someone from Gallup may also contact you about your interest in this topic.